We have removed the earlier report on the IPS forum on NMP Viswa Sadasivan’s speech. We will publish further clarification later today, together with Mr Viswa’s letter to The Online Citizen. This challenge to pragmatism, even by our National Pledge, was something that was deemed so unacceptable that Minister Mentor Lee Kuan Yew, who heard about it from the newspapers, while “doing physiotherapy”, had to intervene in the debate to “bring the House back to earth”, by calling the NMP’s arguments “false and flawed (and) completely untrue”. The NMP certainly did touch a raw nerve, when he suggested in Parliament that pragmatism is but a lure, especially for the ruling party. The ruling People’s Action Party’s (PAP) concept of good government is actually a version of communitarian democracy. Communitarian ideology emphasizes the need to balance individual rights and interests with that of the community as a whole, but its focus on social cohesion raises similarities with various forms of authoritarianism. Upon independence in 1965, a massive cultural transformation of the population was necessary for Singapore to develop economically. This was when the ideology of ‘survival of the nation’ was conceptualised. This ideology of survival has now become the basic concept for rationalisation which extends beyond pure economics to almost all spheres of a Singaporean’s life. If social control can be shown to contribute to economic growth, it is considered necessary for ‘survival’ and hence ‘pragmatic’. But are “pragmatic” policies or “pragmatism” always good? It is but pragmatism which made Members of Parliament (MP) responsible for their estates. Town councils were introduced only in 1989 but 20 years on, its aim has not been achieved as Senior Minister Goh Chok Tong admitted in June this year. Its aim? To “give them (residents) a stake in the process of governance”, SM Goh explained. How do you foster such a thing when in Singapore MPs do not run estates anyway, for all intent and purposes. Instead, the towns are run by professional town managers, employed by the town councils. So, why pretend that they are? As it is, many of our MPs and ministers are overburdened with multiple duties. Take Mr. Teo Ser Luck, for example. He is now Mayor, MP, Parliamentary Secretary and heads the Youth Olympic committee, along with other commitments. As for the other MPs, they have multiple directorships in private and government-linked companies, heads various committees such as Government Parliamentary Committees (GPC), on top of their personal careers. MPs, being so well paid, should focus exclusively on national policies. This can only benefit Singapore and Singaporeans. We face challenging times in this globalised world, as the government has so often reminded us. More heads dedicated to these issues would be the logical thing to do and MPs should therefore be focused on more important national issues rather than be drained by municipal issues. We ought to have non-political grassroots organisations and leaders to take care of these things. The Grass-Roots Organizations (GROs) are there to serve a purpose – they are PAP’s mouthpiece, to explain and convince people of the various government policies, and to be the eyes and ears for the PAP. The citizens who are somewhat supportive of the opposition are not allowed to climb the ranks of the grassroots. Moreover, the opposition MPs, do not get to be advisors for GROs, which are all under the purview of the People’s Association, which is a statutory board chaired by the Prime Minister. The advisors to the GROs (even in opposition held constituencies) invariably turn out to be PAP men or supporters. This is the ‘pragmatism’ of the PAP – resulting in a system which is inherently communitarian. Keep the ordinary Singaporeans anxious and worried about their immediate surroundings their daily lives. Leave the “bigger” things to the government. If looked upon closely, this has been the underlying principle in all PAP policies. With this underlying principle, it is hardly surprising that the PAP now talks of devolvement of responsibilities through the town councils and the constant encouragement to “upgrade skills”. Politics in Singapore is reserved for the handpicked ‘elite’, which results in the almost total absence of politics from the general populace. Just as the GROs are not natural but created to serve ‘pragmatism’, so is trade unionism. They are created exclusively to serve the PAP and its brand of ‘pragmatism’. This is manifested through the appointment of top union leaders who are pro-PAP. These unions thus become para-political, which defeats the purpose of setting up unions in the first place. In the 50s, unions in Singapore were not para-political but truly fought for the rights of the workers. This should be the purpose of unions. Under the PAP’s pragmatic approach it governs through law rather than by law, making amendments to the Constitution as it pleases. This has led some to quip that Singapore does not have a Constitution at all. The PAP takes up more than two-thirds of the seats in parliament, and through the party-whip, PAP MPs are not allowed to vote against the party. Hence, constitutional changes are undertaken with speed as the absolute majority supports it, an aspect praised as a “Singapore advantage” by the government. The executive body is thus infused with the ethos of pragmatism; as such it is an instrument of social control, tailored to the ever changing needs of Parliament, the sole authority of law making. 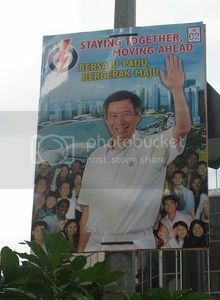 The PAP’s pragmatic approach has inculcated a sense of apathy among the citizenry. Their constant re-emphasizing of the need for economic growth in a competitive environment has led to a generation growing up to be individualistic and ‘kiasu’. Pragmatism has also made the ‘paper chase’ the sole priority of any student, so much so that many have forgotten the importance of being politically aware and in speaking up. Communitarian democracy as practiced by the PAP is one of constant vigilance, where it sees itself as the guardian of collective interest. Phrases such as, ‘harming the social fabric’ or ‘ for the good of the society’ are often verbalised by the PAP when introducing controversial legislations or policies. Yet, beneath this postulation of a shift in ‘ideology’, pragmatism is still undertaken by the PAP as the sole driving force. And so the negative impact prevails. The PAP’s brand of politics in choosing and championing pragmatism, has trumped and rendered obsolete all ideologies. But what good are the competencies and expertise of pragmatism, if it is not tempered with ideology? Ideology is not a bad word. Ideology is but the core fundamental beliefs and political principles which exist independent of considerations for competencies and expertise. For how can we assess political leaders based solely on technocratic effectiveness and expertise in crafting policies, which pragmatism prescribes, without regard to ideology? Just as it is possible to become too rigid and unyielding in upholding ideological beliefs by adhering excessively to principles without regard to consequences, it is equally possible to become so pragmatic that one operates without any core principles. The ruling PAP in engendering an overcompensating desire to rid ourselves of ideology in the name of pragmatism; have robbed Singaporeans and even most of our political leaders currently in Parliament from forming inalienable values and precepts, which are critical in the forging of a true nation. In the end, an over-emphasis on pragmatism limits the possibilities which we might otherwise dare to imagine and aspire to. Read also: Our audacity to hope. And: Have we lost our audacity to hope? Headline picture by Terence Ong, from wikimedia.